I have some ideas for pirate murals and wall decorations that are worth their weight in gold and silver, a virtual treasure chest of resources, instructions and inspirational photos! Enjoy tips for using stencils, stickers and full pirate wallpaper murals to extend the reaches and visual impact of your pirate themed room. Many of these do it yourself wallpaper murals are so quick and easy that you won’t feel that you have had to walk the plank to get professional results! You can find many decorative elements to use in your pirate murals on sale at super discounts certain times of the year! If you prefer to take the wallpaper route I recommend that you focus your telescope on the mural that you feel is right for your child’s pirate decor and wait until you see some cheap end of season sale prices. Closeouts are not uncommon, but if you have your heart set on one style of pirate mural that has no substitute, you might not want to risk the supply running out altogether. Here's a cool video with some instructions, tips and ideas for painting various decorative elements in pirate wallpapers for a pirate theme room. Painting your own wall murals can be lots of fun, but if you don't have a lot of time a pirate wallpaper mural will save you some time and flatten the learning curve as well. There are many seaworthy nursery themes dying to be decorated with a detailed pirate ship with the Jolly Roger flying at full sail. Adventurous buccaneers with knee britches, black eye patches and colorful tropical parrots make interesting roommates! If you think that some of the pirate murals might be too mature or rough for a sweet little baby’s nursery, there are pirate murals for those that don’t get into the violence of pirate life. Perfect characters for an infant or toddlers’ pirate mural would be the evil Captain Hook and the crocodile right out of our favorite classic Disney Movie, Peter Pan, might be the best choice for an infant’s nursery wall mural. If you need a pirate mural for a baby girl’s nursery you can create a more feminine mural with some Tinkerbell fairy wallies, removable stickers, decals or pirate wallpaper borders along with your Captain Hook graphics. Some other images and graphics that you might want to include in a painted pirate wall mural for your pirate nursery or bedroom would be bright green and yellow Amazon macaws and parrots, pirate flags with grinning skulls that are wearing old black pirate hats and, tattered, antique maps telling your little adventurer the exact sandy beach where the pirates hid their buried treasure chests full of gold doubloons and other plunder. Other pirate ship wall murals and decorations that you could use in your pirate theme room would be framed wall maps and 3D pirate memorabilia. You also could stencil the names of famous pirates and pirate ships on the walls as well as some skull and crossbones graphics. For more pirate room baby gear, decorating ideas and projects check out the nursery decorating ideas in the articles featured at Unique Baby Gear Ideas, Nursery Themes and Decorating Ideas. 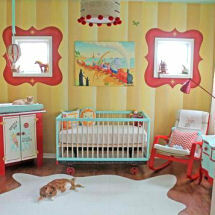 Check out Pirate baby nursery themes that would look great with pirate murals for easy room makeovers.